Have you ever wondered what to wear when you go whitewater rafting? Whether you’re heading onto the outdoors in Georgia or South Carolina, in the fall or spring, bringing the right clothing will add to the enjoyment of your trip. 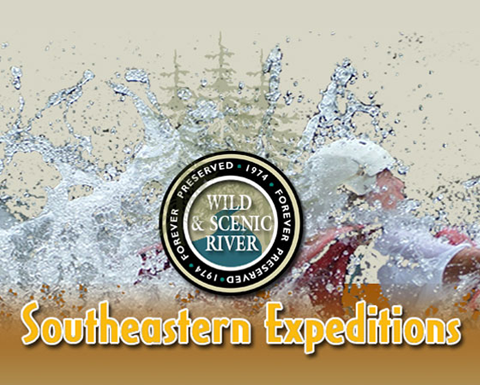 At Southeastern Expeditions, we want your vacation experience to be as memorable and enjoyable as possible. For maximum comfort and safety during your Chattooga rafting experience, it’s important to wear the proper attire. The time of year you go water rafting in Georgia is a determining factor when selecting your clothing. We provide wet suits or paddling pants and jackets on all Chattooga River whitewater rafting trips. Keep in mind that you should take different clothes depending on what time of year you hit the water. No matter what, you’ll want to pack a change of clothes for afterward. During the summer, you (and your group) should wear a swim suit, shorts, a t-shirt and old tennis shoes, river sandals, or water shoes (no flip-flops). Please feel free to bring a towel and a change of dry clothes and dry shoes for after the Chattooga white water rafting trip – we have hot showers. A baseball hat is also useful when rafting in Georgia during the summer for keeping the rain/sun out of your eyes. 1) Wool sweaters, pants, socks, etc. – Anything wool will help because it retains some of its insulating value even when wet. Fleece, polypropylene, and other synthetic materials are also appropriate. 2) A wool stocking cap – A large portion of heat loss is through the head and neck, and a cap can make a great difference. 3) Paddling Pants / Jackets – These help keep the spray off your legs. For your convenience, these are provided free of charge at our outpost. 4) Wet suits – Farmer John style is the best suited to Georgia white water rafting, but any wet suit will do. Wet suits are also provided at our outpost. What Will the Weather Be Like During My Rafting Trip? If you watch newscasts, you may be under the impression that Georgia and South Carolina weather is stormy. The reality is it’s actually quite mild. We experience very few extreme weather events, such as hurricanes. How Can I Prepare For My Whitewater Rafting Trip in Georgia? Packing the right gear for your trip will make it more comfortable and also protect you. In addition to bringing your clothing for the rafting portion of your adventure, you should pack a bag for afterward. You will be wet when you come off the river. Regardless of whether you plan to drive straight home or stick around the area for an overnight camping trip, you will want to change into dry clothes immediately upon your return. Bring a plastic bag to place your wet clothing in. Sunscreen: You will need to apply before rafting and after, too, if you plan to remain outside. Bug spray: Use it beforehand to keep bugs away. Ponytail holders: Those with longer hair will want to keep it out of their faces. What should you leave at home? Heavy clothing, flip-flops, jewelry and jeans should stay behind. Will I Be Cold Whitewater Rafting? The weather in Georgia and South Carolina remains mild year-round. We recommend layering to avoid getting too cold on your rafting trip. That means starting with a thin base layer — avoid cotton, because it soaks up water — and building from there. You can always take off clothing if you warm up. This way you won’t get cold while rafting. When Is the Best Time to Go Whitewater Rafting? The most popular time of year for us is the summer, when we see our biggest crowds. The hotter weather draws people to the water. Is Whitewater Rafting Available in the Off-Season? To avoid the crowds, you may want to consider booking in the off-season, outside the May-to-September rush. The Georgia and South Carolina weather in the off-season is cooler. We do take a short break during the winter, when those temperatures dip, but booking right after we return from that time off is a great opportunity to get out on the river. If you have any questions concerning what to wear when whitewater rafting in Georgia, feel free to ask one of our Adventure Specialists while booking your trip. Southeastern Expeditions wants you to be as comfortable as possible during your journey so you and your entire family or group will want to come back again and again! The off-season is also a great time to book rafting trips for next Spring, as weekends can fill up fast and availability on the river is not gauranteed for last minute reservations. 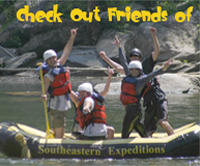 However, should you attempt to reserve a rafting trip at a time when Southeastern Expeditions booked up, we can likely accomodate you at our sister outfitter, Raft1, the top rated whitewater outfitter in Tenessee.